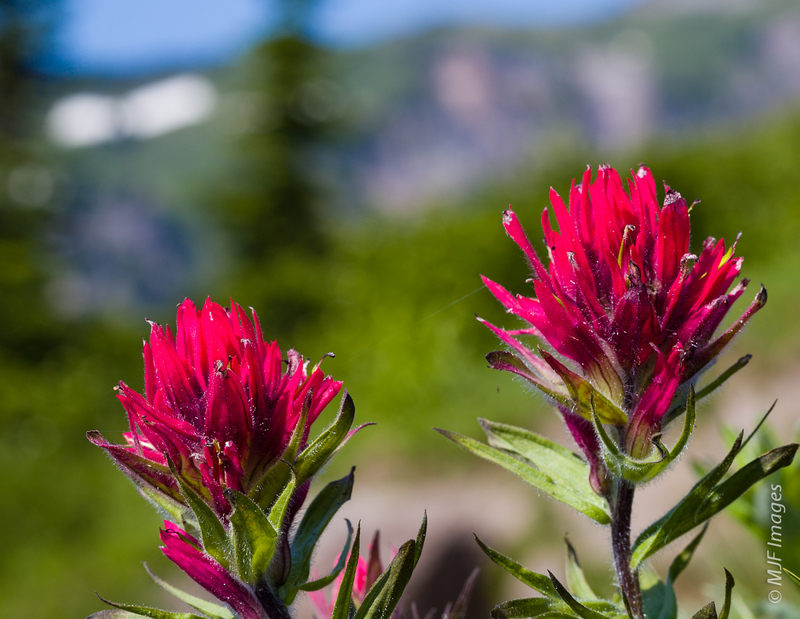 Indian paintbrush bloom in Paradise Park on Oregon’s Mount Hood. Shifting gears now, into the realm of my nature & landscape photography & exploration. But I’ll return to travel again soon. Mount Hood is the closest major mountain to where I live in Oregon. I don’t think I could be happy living somewhere without mountains. I will never understand why people retire in flat Florida. We in the Pacific Northwest of America are blessed with several different ranges of mountains, but it’s the Cascades that are the tallest and most convenient to where most of us live. Before going on, I should mention the images you see here are available for licensing and download, or you can purchase as prints. Visit my website or contact me for more details. It’s not lawful to download and use them without permission. Thanks for your interest and cooperation on this. Okay, back to the mountains! We have had a much cooler and wetter Spring and early Summer than the rest of the country. And so the high country has been slow to melt off. But now the snow is beating a rapid retreat and flowers are beginning to reach their peak in the subalpine meadows of the Cascades. Lupine bloom along the ridgeline near Paradise Park on Mount Hood, Oregon. One of Mount Hood’s finest hikes follows the Pacific Crest Trail west from Timberline Lodge and drops for a few miles, only to rise again to Paradise Park. It is about 11 miles but feels longer. You will do most of your climbing on the return trip. With photography it took us a full 8 hours to do the hike. That includes the 1/2 hour we spent building a rock bridge across Zigzag Creek. We could have simply taken off boots and waded across, but that would have been too easy. Besides, who doesn’t like building things, even if it is only a dozen rocks plopped into a river to form a hop-hop crossing. Those rocks were heavy though! 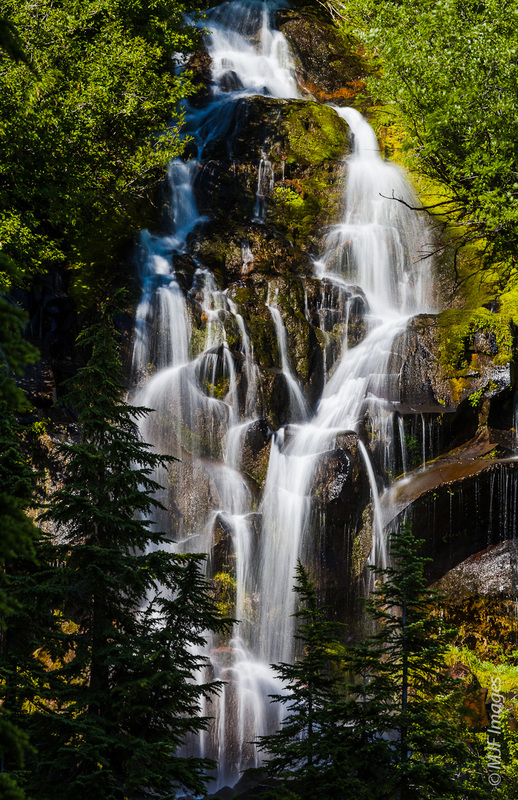 One of the numerous waterfalls along the trail to Paradise Park, Mt Hood, Oregon. The weather was perfect, sunny but not hot. 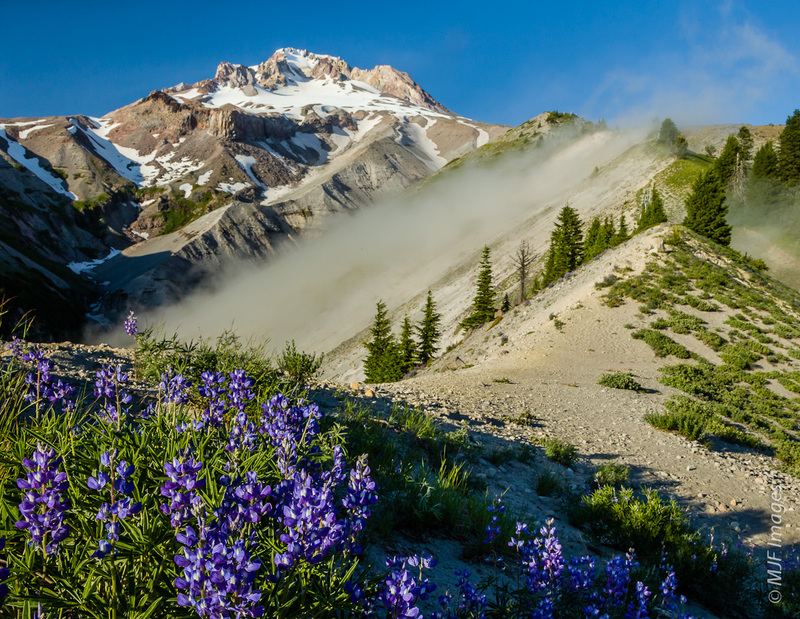 Beautiful lupine, indian paintbrush, glacier lily and beargrass, along with other flowers blooming along the trail, water tumbling everywhere, and the west face of 11,235-foot Mount Hood looming over all of it. I mentioned the crossing of Zigzag Creek, but you will also need to cross the canyon it has carved. Moderately steep switchbacks on either side make you earn your entrance to Paradise Park, which extends north from the opposite side of the canyon. Soon after crossing the creek, a loop route departs the main trail and enters perfectly named Paradise Park. Park is a word applied to subalpine meadows near timberline (at 5000-6000 feet elevation here). Gorgeous streams lined with water-loving wild lily and monkeyflower pass boulders dropped by glaciers. Glaciers are still visible from here, but they have retreated far up the mountain during recent (warming) times. There are several great camping spots, and one was occupied by a backpacking couple. On the return trip (it’s an out and back hike), the clouds which had been hanging in lower elevations began to rise and swirl among the trees, causing a beautiful effect looking toward the sinking sun. Light was shifting so fast I did not bother to set up a tripod, and it was just bright enough shooting into the Sun for hand-held pictures. As we approached the Lodge, Mount Jefferson formed a distant counterpoint as the last rays of the sun hit the iconic building. Mount Hood’s Timberline Lodge is less than an hour and a half from Portland, Oregon, and parking is free. In summer Timberline is crowded with ski camp participants, mostly youngsters in bright lycra. They look a little funny in their enormous boots, lugging bulky boards. You might think the trail would be crowded as well, but realize that most people do not have the energy for an 11-mile hike, so you should only see a few other hikers in Paradise Park. 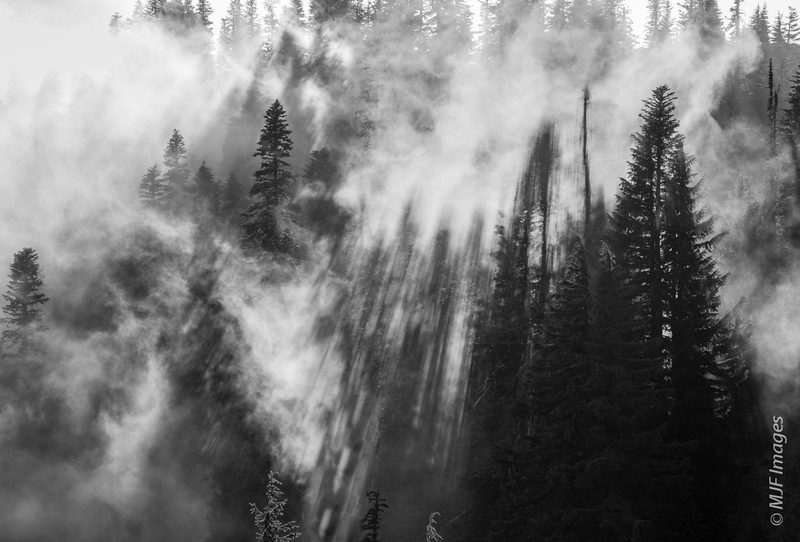 Mists swirl through the forests of Mount Hood in Oregon. This hike is near the top of my list on Mount Hood. There are a few other great ones, but Paradise Park requires a fairly short drive and you get to park somewhere that does not require a Forest Service parking pass. For me, one who does not go along with the Forest Service on this, it’s a nice bonus! So if you find yourself at Timberline Lodge some day, set aside the good part of a day to do Paradise Park. If you don’t hang about taking tripod-mounted pictures, it should only take about 6 hours. You will thank yourself for taking the time to hike through the flower-filled meadows and beautiful forests of Mount Hood. We don’t have the highest mountains in the world, and they are not stacked on top of each other as in the Rockies or Alps (they are isolated volcanoes). But this is enough for me. And since Portland lies only an hour or so from the Cascades, it’s the next best thing to actually living in mountains. I’m watching many family members and some older friends retire to Florida now, and I just can’t see myself joining them. Where would I hike? Where would I ski? No thanks! 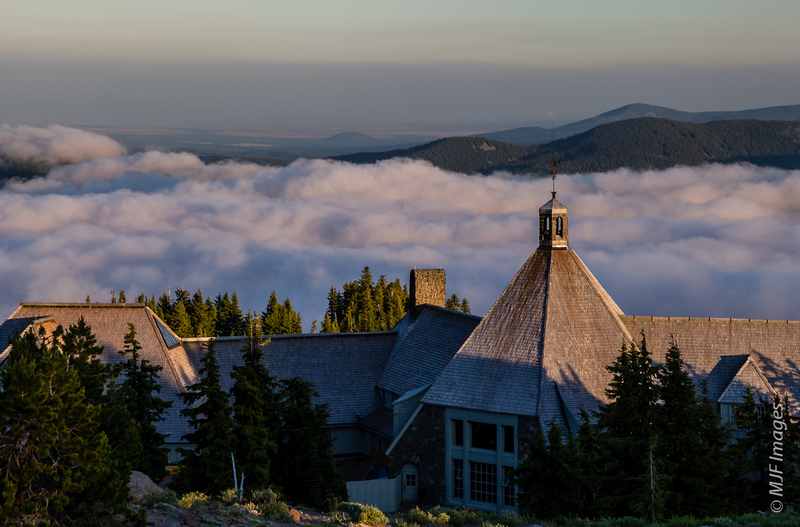 Timberline Lodge floats above the clouds on Mount Hood in Oregon.